* This is my article in BusinessWorld on April 19, 2017. 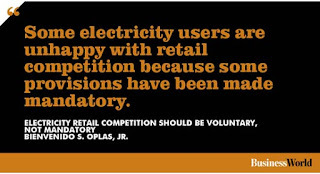 Electricity distribution, unlike generation, is defined as a “public utility” and hence, is granted as a monopoly right via congressional franchise. There are more than 120 distribution utilities (DUs) such as Meralco and electric cooperatives. To dilute this monopoly, the Electric Power Industry Reform Act (EPIRA) which was passed in 2001 came with Section 31, Retail Competition and Open Access (RCOA) that “shall be implemented not later than three (3) years upon the effectivity of this Act,” and Section 29, Supply Sector, “The supply of electricity to the contestable market ...” These are useful, anti-monopoly provisions, thanks to EPIRA. The RCOA was finally implemented 12 years after, on June 26, 2013. The Department of Energy (DoE) and the Energy Regulatory Commission (ERC) issued orders to implement this beautiful provision. But somewhere along the way, what should be a competitive scheme has become a “mandatory” order. Some electricity consumers are unhappy because their choice to stay with their DUs -- especially if these provide them good service and prices -- has been done away with. This is why they went to the Supreme Court (SC) and asked for a Temporary Restraining Order (TRO) against the RCOA. Below is a summary of these orders (one from DoE, four from ERC, and one from the SC). The SC TRO has mixed signals. 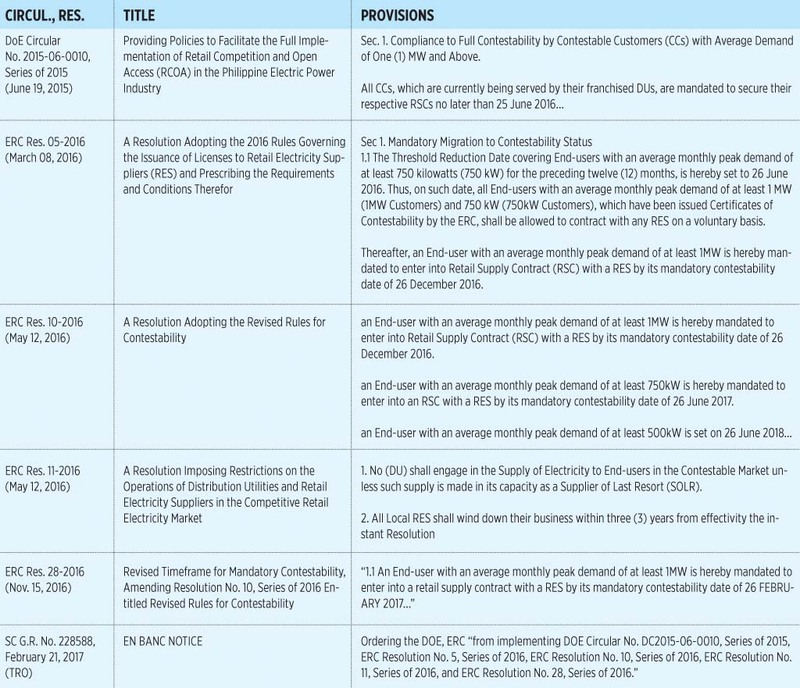 It is good because (a) it stopped the “mandatory migration” to RES by contestable customers (CCs) and thus, they have the option to stay with their DUs or not, and (b) local RES will be allowed again. But it can also be bad because (a) it stopped the voluntary participation of CCs for 750kW (lowered threshold), and (b) some ERC Resolutions suspending earlier prohibitions to Retail Electricity Suppliers (RES) are also removed. Government prohibitions should be kept to the minimum as much as possible. These prohibitions would give people -- especially those with very low technical and financial capacities -- the right to become RES which might invite abuse of CCs. Such prohibitions should not include more RES players, the right of CCs to stay with their DUs or not, and voluntary participation of customers at 750kW. EPIRA has provided for more customer choices, strengthened consumer empowerment, and demonopolization of electricity generation and distribution. Let this spirit stay in the succeeding orders of the DoE and the ERC.